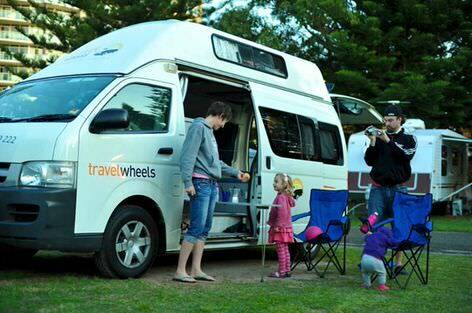 Travelwheels has introduced a new style of campervan for hire across our branches in Australia. For example, we can now offer great deals on 2 person automatic camper van hire. These are fantastic for anybody looking for budget campervan hire with automatic transmission. Therefore don’t delay and call our team on 0412766616 for our lowest prices on automatic campervan hire! With travelwheels all our automatic camper van hire deals come with unlimited kms along the east coast. Furthermore, a lot of our competitors also charge you for sleeping bags, chairs, etc. For instance some charge you for cooking and living equipment! Therefore compare this with what travelwheels offers. Here at travelwheels you get all the cooking, living and sleeping equipment included in the price! To summarize, look at this list below, and all that is included! Remember the equipment we supply is already included in our price for automatic campervan hire in Australia. Proper 40L fridge and not a tiny mini fridge or icebox! Travelwheels automatic campervans do not have big bold graphics plastered all over the side of our campers! Now coupled with the fact that we don’t have brightly coloured campervans, you will not stand out like our competitors! Therefore this makes it especially easier to do free camping in Australia! If you have a Wicked, Jucy, Travellers Autobarn or Spaceships small campervan they are loaded with big graphics! This therefore means everyone will know you are a tourist on holiday in Australia! You will really stand out on the side of the road as a result of this massive graphics! With our clean campervans, it’s easier to remain anonymous. As a result of this we don’t have any big graphics on the sides of these automatic campervans. This way you don’t feel like you are a mobile billboard adverting a campervan hire company in Australia! Travelwheels Automatic Camper van hire with fridge and no icebox! Most of our competitors have super small fridges or even an icebox in their campers! For example, Wicked, Jucy, Travellers Autobarn or Spaceships all have either iceboxes or tiny fridges! 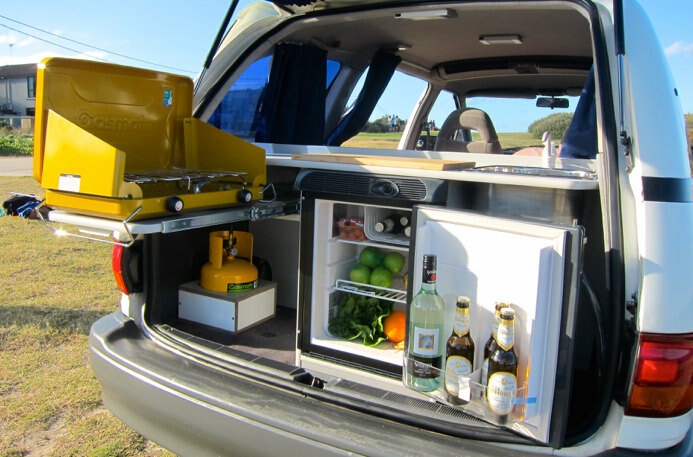 With travelwheels all our small 2 person automatic campervans come with a 40L fridge fitted as standard. This means you will have plenty of space for your food, and some beers as well! Cooking in our automatic campervan – 2 burner cooker! Furthermore, another positive thing about this great automatic campervan is the kitchen area. Some of our competitors only have a tiny one hob gas cooker with a small gas canister! Imagine trying to cook a simple meal with only one hob! How are you going to cook spaghetti and sauce with a single hob! With travelwheels we supply you with a twin burner cooker. In this case, the cooker also has fold out wind guards to make it easier to cook. You get a standard 2kg gas bottle which by the way is cheap and easy to refill. Drive to any BFC store, some campsite operators or service stations on the side of the road in Australia and you will be able to get a refill here. These refillable metal gas containers are better for the environment. They are especially way cheaper than those tiny gas canisters from some of our competitors! You can contact our friendly team for 2 person automatic camper van hire in English in deutsch or Français. We have staff from Germany and France who have travelled all over Australia. Therefore we can help you plan your trip and speak your language! Remember we are not a faceless on online campervan reseller with low prices, but no stock! We have a depot in Sydney, and you can pop by and view all our campervans for hire. Why not pop by and test drive an automatic campervan before you put down a deposit? Read some of our customers reviews here. Our address for our Sydney Branch is 11-15 Clevedon Street, Botany, 2019, Sydney. Click here to view a map of Sydney depot. Furthermore, not only do we price match, we will beat our competitor’s prices! 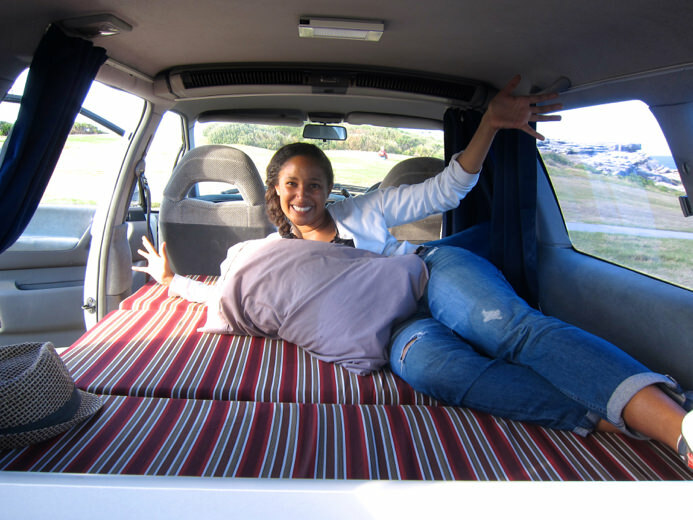 For example this applies for most of the popular campervan hire road trips in Australia. To summarize, when you hire our automatic campervans the price already includes everything you need. Together with two camping chairs, sleeping bags, pillows, cups, bowls and all we need is you now! Most of our competitors especially charge extra for these essential items which is naughty! To summarize, everything you need for automatic campervan hire in Australia is included in the price. 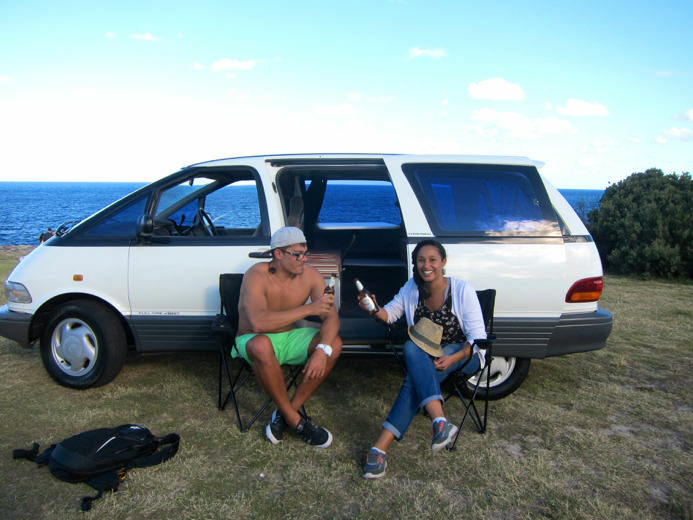 If you can find a cheaper price for Sydney to Sydney campervan hire deal here in Australia we want to know! Remember we can’t price match over Christmas, New Year or Easter as we are always sold out! Furthermore our staff will do our very best to beat all quotes with our automatic campervans . All you have to do is email travelwheels and send us the competitors quote. We will beat it by 10% on all short term Sydney to Sydney camper quotes, out of peak season! For more information about our price promise on our website. You can check out this page on our website about our campervan hire price promise guarantee. 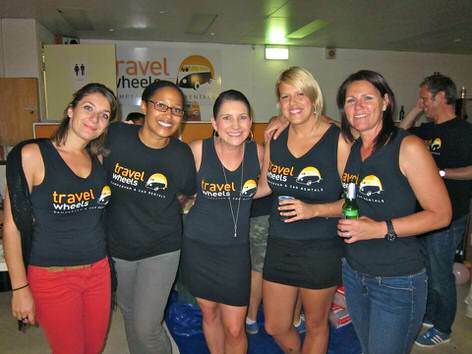 If you are especially after a 5 person automatic campervan rental in Australia, then travelwheels has an option for you. We have our popular 5 Person automatic campervan for hire in Sydney, Brisbane, Cairns and Melbourne. These are great for groups of up to five people! It’s an automatic campervan, so easy to drive and plenty of space for your crew. 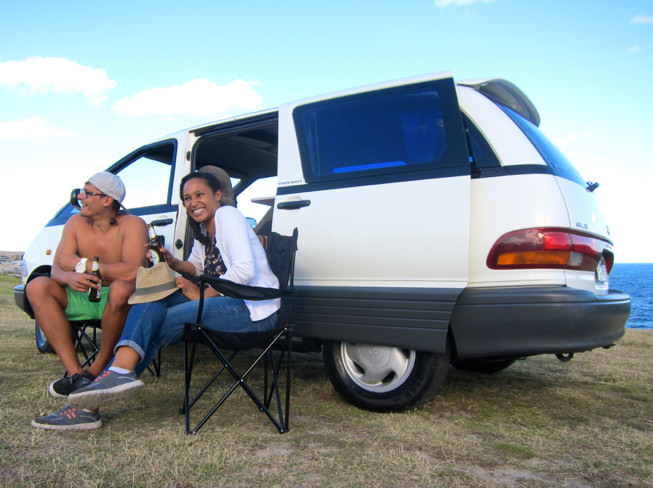 We offer fantastic deals on both one way campervan hire across Australia. Here at travelwheels we also offer long term campervan hire discounts on automatic camper hire. If you are especially looking for that automatic camper van hire deal, then Travelwheels is the place to be! Together with our friendly staff we can find you a great deal on budget automatic campervan hire. Here in Australia we have depots in Sydney, Brisbane, Cairns and Melbourne! Remember we are not an online reseller, consequently you can view our campervans or do a deal with us directly! Therefore, enter your dates below and our online campervan hire price checker will give you our lowest price automatically!